To meet the diverse requirements of our prestigious clients, we are engaged in providing an excellent range of Hydraulic Press Machine. This press is extensively demanded by our clients for its rugged design, easy and reliable operation. 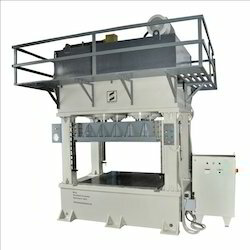 The offered press is available in different models and specifications, as per the necessities of our esteemed clients. 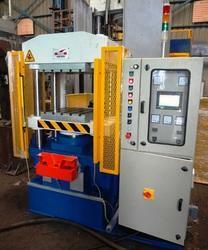 With the experience of years and highly dedicated professional we are able to manufacture Hydraulic Press. For those looking for supreme quality Hydraulic Press for large scale industrial operations, our company is the best destination. This particular equipment is mainly used in the rubber, Bakelite, plastic as well as thermal industry. The main application of this product is to increase the quality of the molded and pressed product. We are among the reputed organizations, deeply engaged in offering an optimum quality range of Heavy Duty Hydraulic Press Machine.